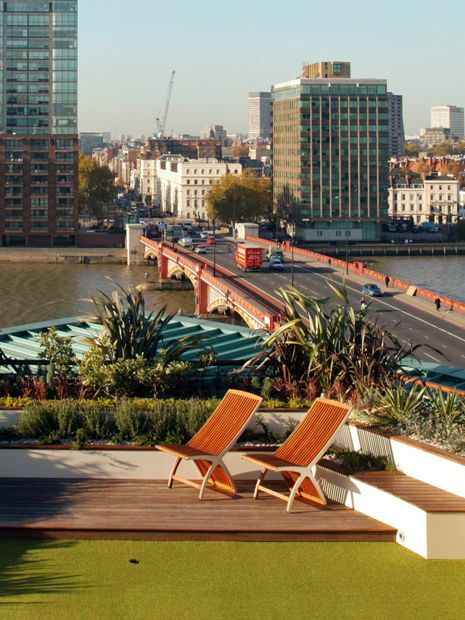 When our client approached us to design and construct a new roof garden on the 7th floor of Bridge House at St George Wharf, we truly relished the opportunity to immerse in a 3-month rooftop adventure, hovering right above Vauxhall Bridge. 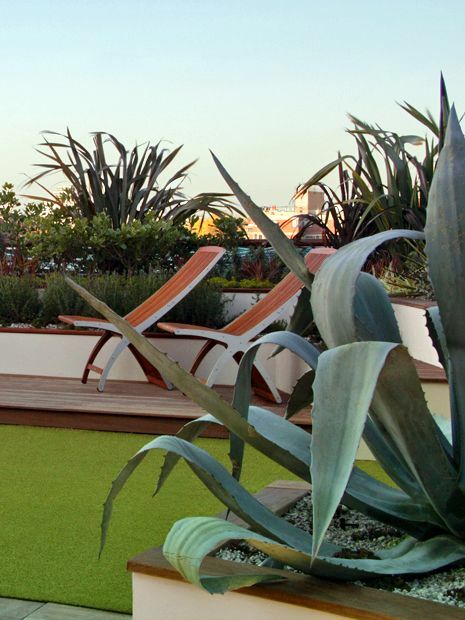 This 220-square-metre rooftop was transformed from a desolate, unusable platform into a state-of-the-art rooftop garden, encompassing abundant seating and coastal greeneries, amid varied entertainment and golfing zones. 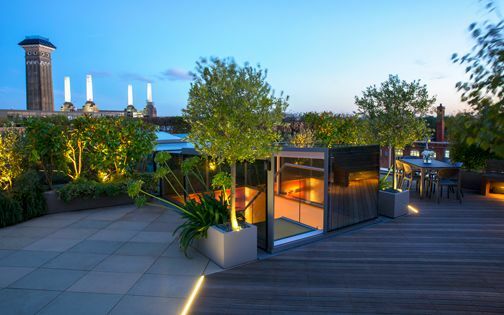 Portrayed with images by internationally renowned architectural photographer Timothy Soar, we guide you through this one-of-a-kind roof garden's contemporary design & build process and its cinematic panoramas. 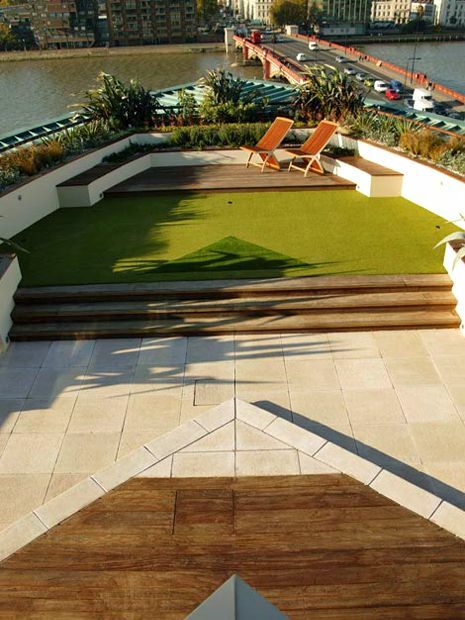 An Iroko hardwood deck, designed in a repeating pattern of three 4” and two 6” boards, embraces the living room's facade, while echoing St George Wharf's distinctive boatlike outline. In consultation with the development's project manager, we fastened deck rafters firmly onto their paved substructure to minimise possible levitation in relentless wind engulfing the site. The deck's hydrodynamic affiliation defines its surrounding riverside quintessence, while balancing the wharf's voluminous shadows cast by towering glass panes and multilayered, arciform balconies. 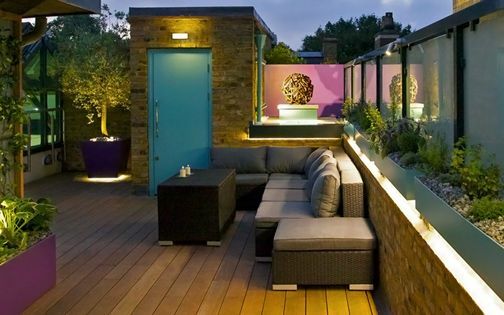 Edged by pavers, custom-made fascias, recessed lights and a Box hedge design, the main deck's detail characteristics are reiterated in raised beds' coping, built-in seating, upper lounge steps and a further sun deck at the roof garden's apex. Thames' persistent airstreams bluster like clockwork through St George Wharf's riverfront rooftop terraces, levitating unanchored objects they encounter en route to their tributaries. 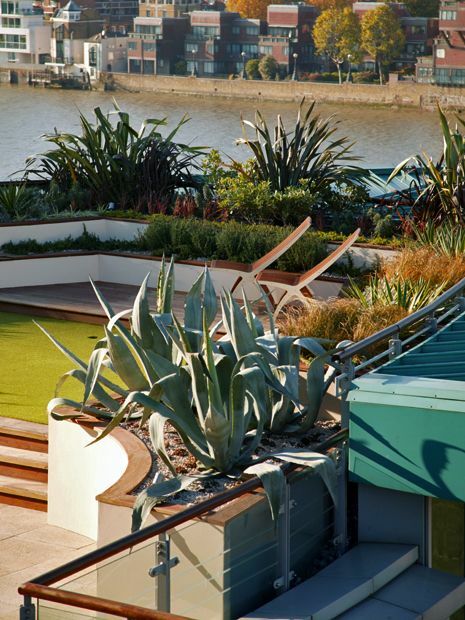 While surface design patterns follow the building's inherent contours, delineating integral curvature, the roof garden's matrix of built-in raised beds merges seamlessly with a symmetrical continuum, underlined by diverse coastal flora. Wind exposure is mitigated by 16 selected species of Mediterranean rooftop vegetation in 3 distinct groups. Agapanthus, Agave, Convolvulus, Euphorbia, Lavandula, Rosmarinus, Sedum and Sempervivum define low-lying prostrate forms, alongside resilient grasses and grass-like perennials including Carex, Imperata, Miscanthus, Pennisetum and Phormium. 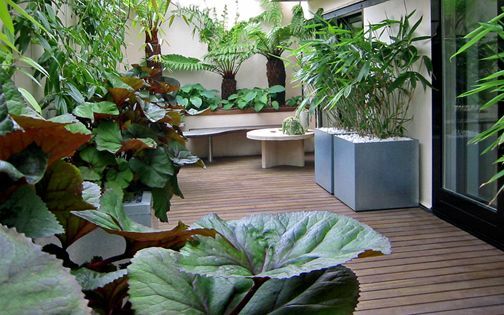 Architectural shrub accents are demarcated with variegated Pittosporums and Mound lily Yuccas, while two Buxus cultivars line the decking and seating zones in three varying heights. 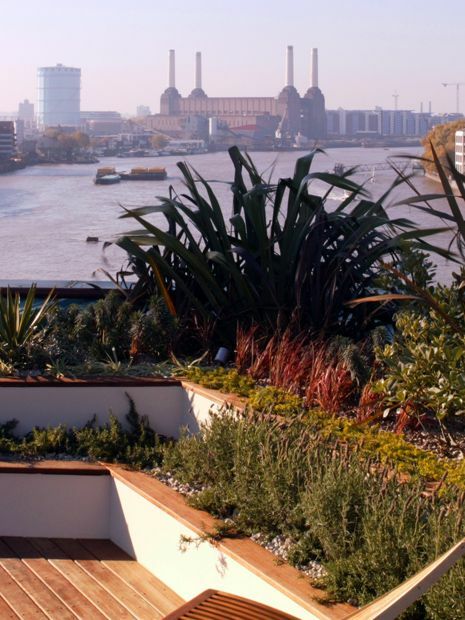 Well-irrigated, well-drained, and copiously mulched in decorative granite chippings, this roof garden planting scheme contrasts grassy movement with silhouetted shrubby sturdiness – infused with aromatic fragrance which wafts in riverside aeriality. 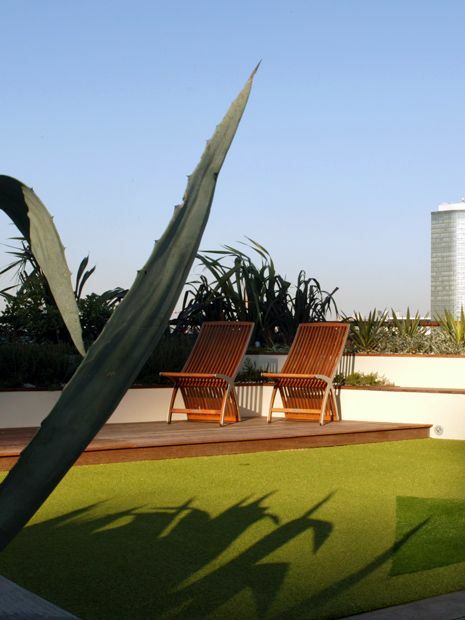 There's plenty of fun to be had with a touch of artificial grass, and the two synthetic piles utilised across the roof garden's upper deck add verdancy, amid St George Wharf's contiguous concrete make-up. This large entertainment zone doubles as a 3-hole golf putting green, providing a contrasting, non-directional expanse, while enhancing our client's penchant for offbeat outdoor pursuits. 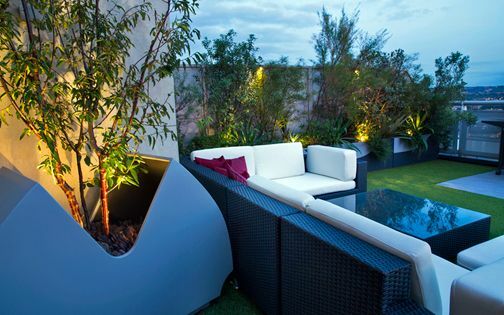 Surrounded by herbs, spacious built-in benches and speakers, this alfresco zone highlights the culmination of an expansive rooftop garden design sequence with an intimate yet upbeat setting. 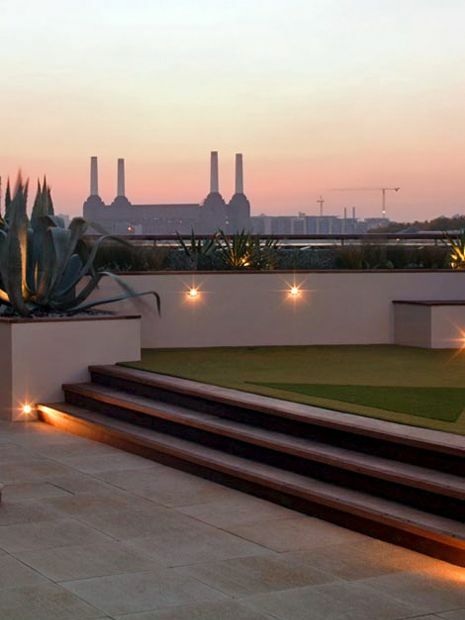 Reiterating Embankment's prominent London plane tree canopies, neighbouring SIS Building's viridescent cladding and St George Wharf's jade-green facade, the grass lounge perches atop its terrace's highest vantage point, along a compelling sightline linking sweeping vistas of Battersea Power Station to the west and City of Westminster towards Lambeth Bridge. While visiting specimen plant nurseries in Tuscany, we spotted half-dozen magnificent Agave americana, the Century plant, ideal not only for this site's harsh conditions, but also to match its facade outlines and distinct turquoise colour palette. The glaucous-leaved specimen plants were gingerly loaded onto a refrigerated Italian lorry, together with various mature Buxus hedging sizes, and made their way from Central Italy to a holding bay in a Surrey nursery. Halfway up Bridge House, these spiky sculptural statements define and frame St George Wharf's vista with their piercing silhouettes under Lambeth's skyline. 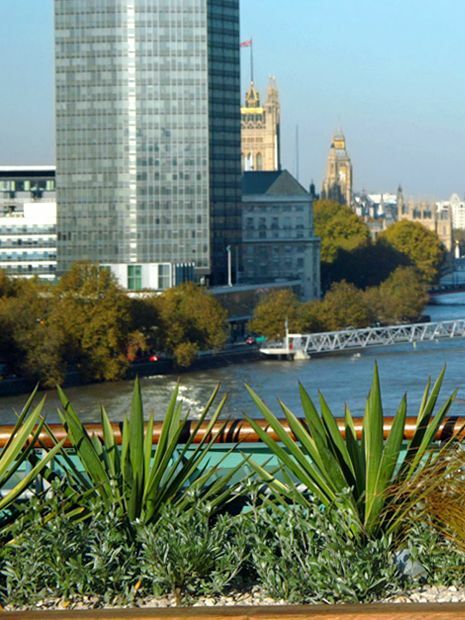 With Bankside riverboat services making a convenient stopover at Vauxhall St George Pier, and a buoyant, vast regeneration programme all across SW8, this development's centrality and its eighteen towers containing nearly 1,500 apartments, one of which forms UK's tallest residential building, preside Vauxhall Bridge's riverscape audaciously. This intensely noisy urban environment, although alleviated by triple glazing when indoors, forms a central, permeating attribute of its roof gardens' outdoor experience. Nonetheless, the terraces commanding positions above River Thames' Vauxhall Bridge define a well-balanced London perspective like no other; it's indeed the pinnacle of lofty river views and Battersea sunsets – encapsulated in their perceptive aerial barometer, generating up-to-the-minute cityscape vignettes. Despite its protracted construction phase, lasting over a decade, lack of affordable homes, tower's fatal helicopter crash, having been voted UK's ugliest building numerous times, and twice the world's worst by the Architects' Journal, this development's ambience yields a sight to behold, aboard the good ship St George Wharf. While voyaging via communal lifts at times sustains surreal encounters with past prime ministers, industry moguls and other familiar faces, when arriving at the site's sky rooftop gardens, following a traipse through endless corridors, one's anticipation of river skyline awesomeness certainly exceeds assumptions and the wharf's well-established notoriety. The building's concrete cladding, finished in reconstructed stone, isn't as extravagant as its adjacent SIS Building's pristine marble facade, producing a monotonous continuum of sandy tones beside Vauxhall' riverfront, animated by vast sea-green glass elevations. 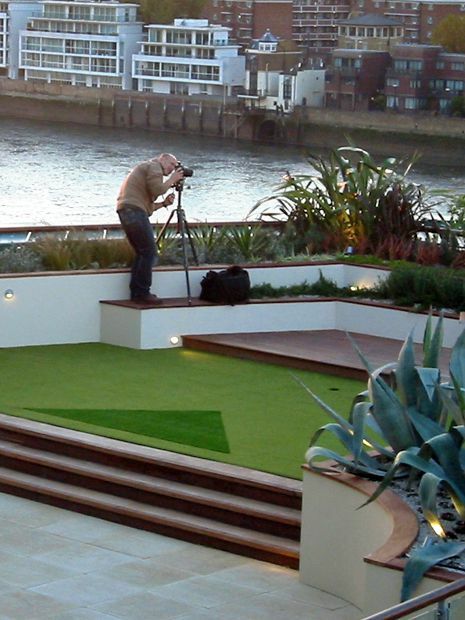 We utilised bespoke, precast Blanc de Bierges buff concrete pavers and edges in two distinct finishes to merge the roof garden surfaces with a towering facade, and while the terrace conceals a maintenance grid of no less than thirteen abseiling anchor points, we built removable covers for each position traversing the deck and paved areas. 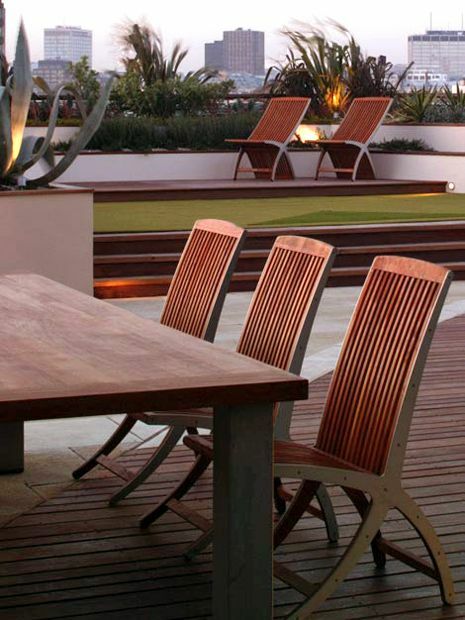 Seating zones across this vast rooftop take diverse shapes and forms, and convey our client's zest for entertaining outdoors frequently. 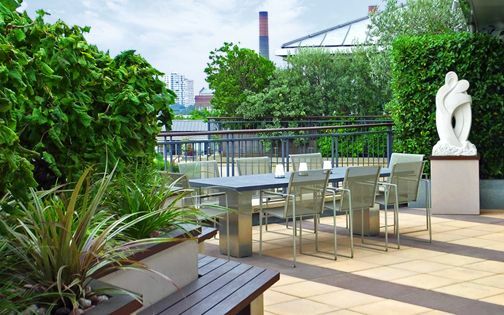 The roof garden's main dining hub is defined by a sizeable Indian Ocean hardwood furniture set, aligned along a built-in bench which conceals storage space. 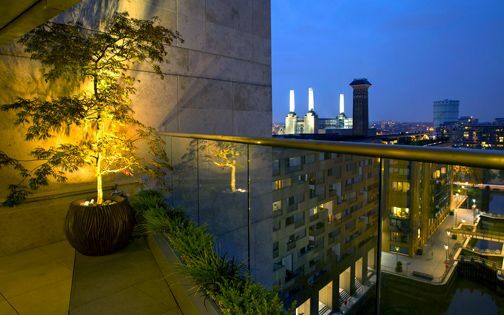 Secluding a myriad of overlooking balconies, a two-tier, 1.5m-high Box hedge creates a windbreak towards prevailing Westerly gusts – featuring a stepped end segment to enable Battersea views at sitting height. A 10-metre-long flight of stairs links lower and upper levels with three steps, facilitating further casual perching spots, and leads to a golfing green. The top section articulates informal garden ambience with a grass platform, enveloped by benches, a deck and chairs, and while facing the building, two Agave trios anchor its vista centrally as sculptural focal points, displayed in curved raised beds. 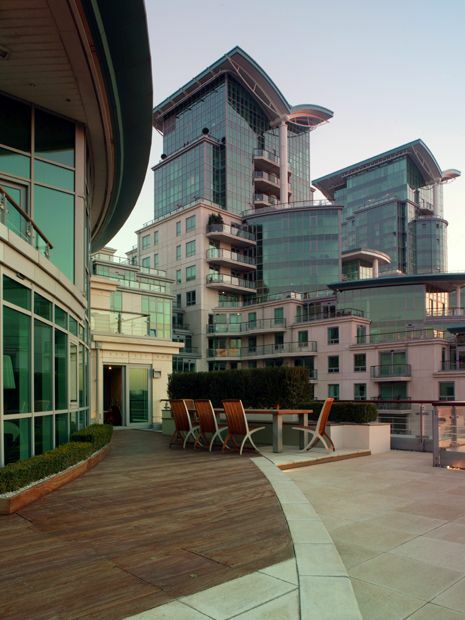 Running this project entailed some logistic ingenuity, and without organising vital vehicular access with St George Wharf's management, the prospect of facilitating its spectacular endeavour would've merely dwindled into roof terrace mundanity. 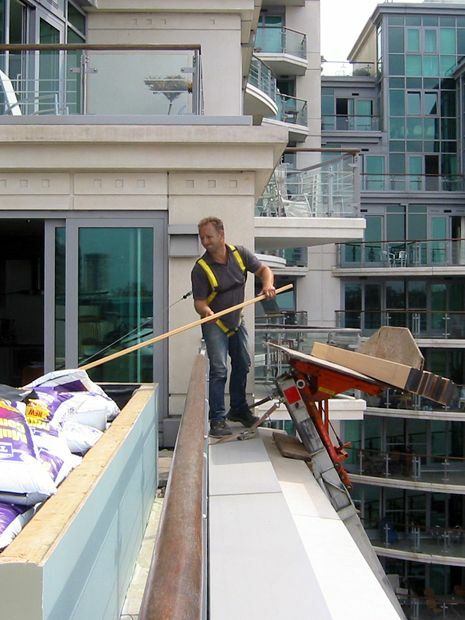 By parking an external, trailer-mounted furniture lift directly below the apartment's elevation, within the building's internal courtyard thoroughfare, we hoisted the bulk of oversized construction materials, such as timber joists, deck boards, paving stones, compost and aggregates, while certain plants and tools were navigated internally by utilising flatbed platform trolleys. The daily building routine consisted of removing balustrade glass panels along the west perimeter and harnessing to abseiling points, while delivering goods in and conveying refuse out. This recurring modus operandi naturally provided an entertaining spectacle to observing crowds, albeit requiring sheer stamina throughout a 3-month period. 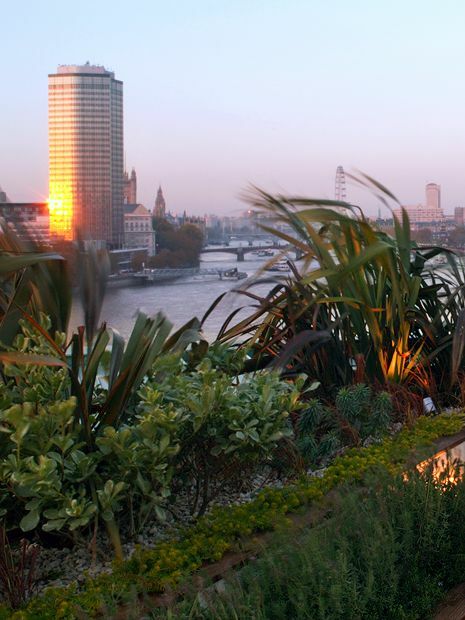 One million square feet of concrete and not a single outdoor water tap to sustain a liveable roof garden... 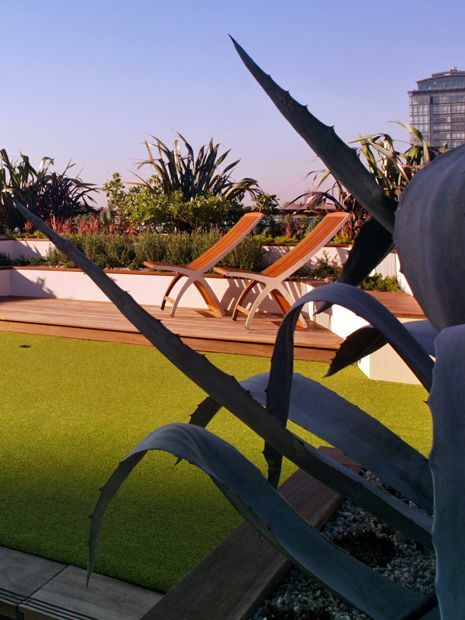 This habitual developers' trait is a peculiarity we've grown accustomed to, and continually mitigate, requiring on-site plumbing inventiveness – absolutely paramount in transforming roof terrace landscape designs into thriving, green roof gardens. 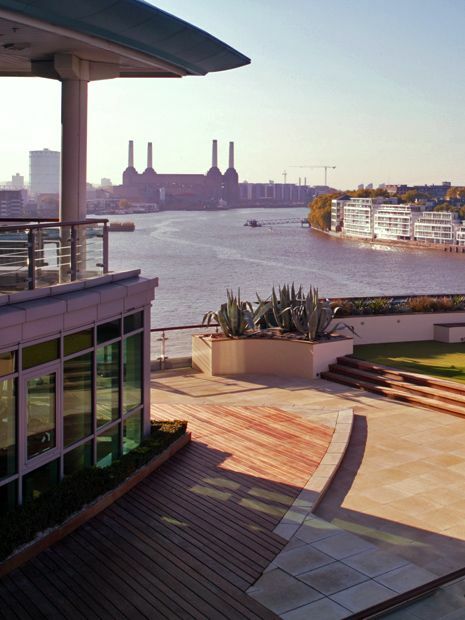 St George Wharf's redeeming feature, however, manifests itself resourcefully in Vauxhall Tower's seamless, well-integrated ecological renewability, sustained by a wind turbine and thermal storage, greatly reducing its carbon emissions. 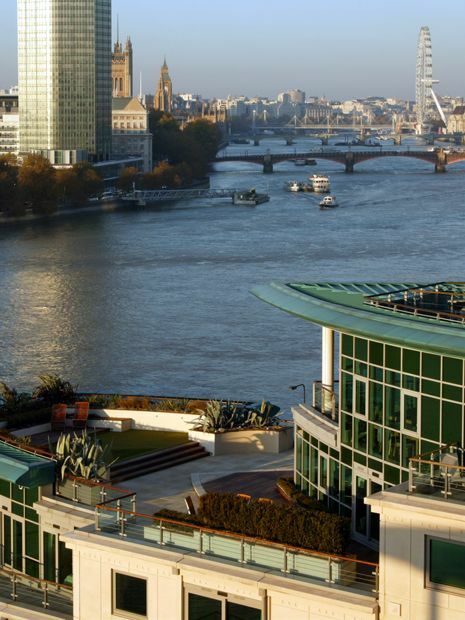 London's sprawling riverine lifestyle, which engulfs the Thames at an unprecedented pace, capitulates its inherent urban originality, charm and uniqueness – transforming historic nuances indiscriminately into bundled international investment properties, and alongside St George Wharf's prodigious, hulled framework, so does its riverbank remains irretrievably hollowed out. 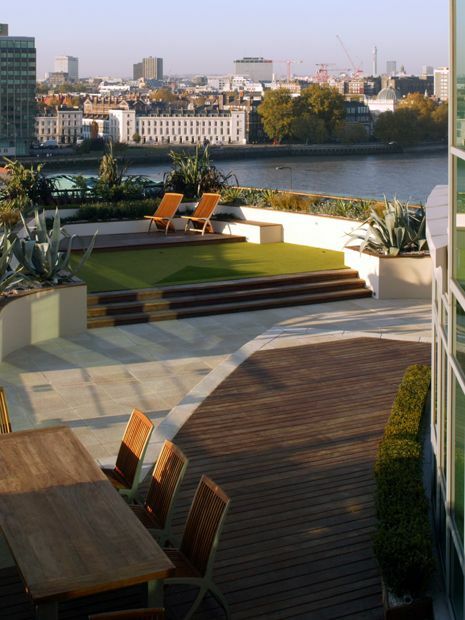 While designing and building roof garden projects in and around the capital's undulating watercourses, we've observed this quayside emerge from its first foothold to a 50-storey skyscraper, complete with a colossal underground parking network, London's loftiest swimming pool and overall property values simply quadrupling. Since Thames Barrier's project inception in early 1974, the city's longest river had unquestionably re-established its vitality and prominence, sustaining unparalleled growth, and with St George wharf's immense skyglow, hovering Vauxhall Cross in an unreserved manner – living by the river takes a whole new meaning altogether. 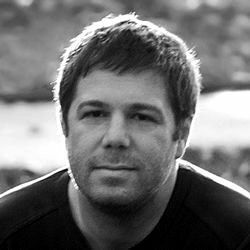 Our client's fierce determination, amid seemingly impossible access, tough river microclimate and an extensive works schedule steered an inspiring, reciprocal design & build process over an entire summer. 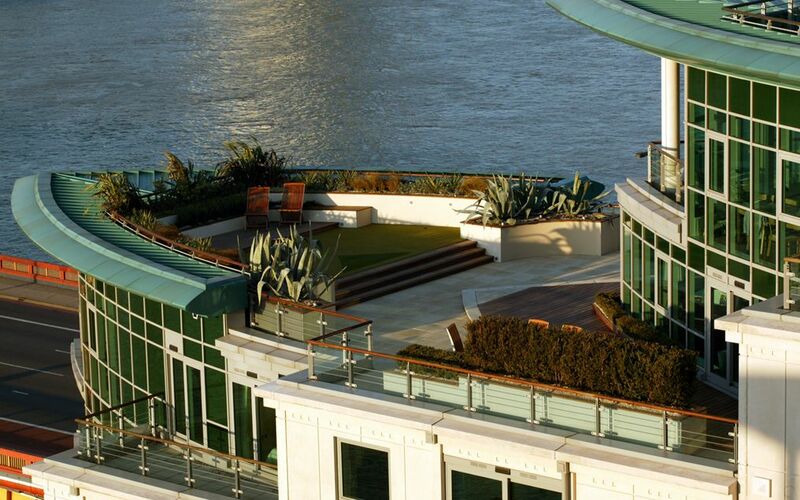 This floating roof garden aloft Bridge House, with its sheer on deck ambience and architectural congruity afront of an uncompromising, clustered building, captures a myriad of iconic London landmarks as cinematically as roof gardens get. At 2,500 square feet, encompassing a sinuous blueprint juxtaposed with minimalist linearity, this rooftop garden interweaves dainty herbal clusters and robust sculptural flora above an optimal triad of textural surfaces and progressing patterns. 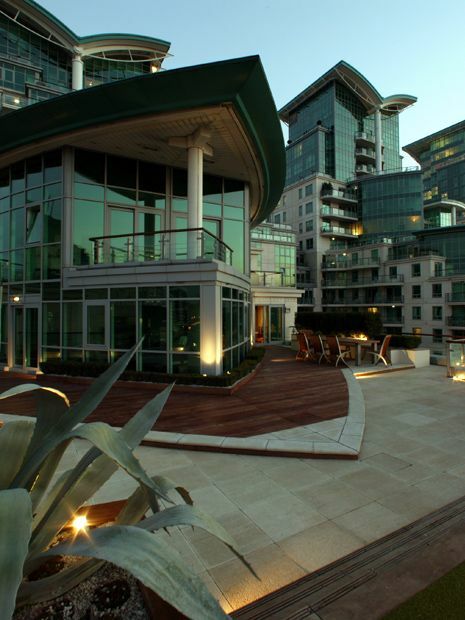 While the scheme continues to thrive abreast an evermore built-up environment, we advise its new owners with an ongoing maintenance outlook – here, at the glaringly astonishing St George Wharf.